Yesterday my mom and sister left and I spent the day with my children, alone, for the first time in several weeks. The kids were great and we had a good day but I was a little down. I am feeling much better today and have decided that a new sewing challenge might be a good distraction for me. I am going to tackle the Allison Glass Feathers pattern. It's something very different for me: it's mostly paper pieced, I am using all solids, and it's on the smaller side (55 x 66). I am in the process of printing the templates onto the foundation paper- but I am having trouble with my printer "eating" each printed paper- it's a 50/50 chance on whether the template will come out usable. I have tried feeding a sheet one at a time, placing regular printer paper behind the foundation, and putting several foundation sheets in the tray. Any tips, dear readers? Is it just my crappy printer's fault? Thanks to everyone for sharing my joy in the new sewing room. I have another quilt-related feature of our new home that I am really excited about: a quilt hanging wall. My husband attached a heavy-duty curtain rod to one of the main walls in our front living room and we found rings with clips that hang the quilt. It adds a lot of depth and drama to our home and I am sure my husband is excited about the simplicity it will add to our lives when I need a picture of a quilt. I chose to hang this African Heart quilt first because it is my most favorite quilt I have made. I plan to rotate a new quilt in every month or so. Someone asked me if I was worried about light damage to my quilts: I don't think it's any worse than using the quilt on a bed (especially in sunny Colorado) and I firmly believe that quilts are meant to be used in spite of any damage/use they eventually acquire. Once in a great while my printer will eat my Carol Doak paper, but for the most part, it just goes right through. When my printer is acting up, I tend to feed the paper in one at a time. Do you separate the paper before you put it in the tray? Sometimes that helps so that the printer doesn't pull multiple pieces at once. I've learned that when I separate my foundation paper (I buy reams of newsprint off Amazon) and then stack them back together, they work better than just moving from the ream to the printer. Makes them less likely to stick together and cause havoc. I also firmly believe quilts are for using and it drives me nuts if I give someone a quilt and it stays rolled up because "it's too nice to use". No, it's perfect for use, and I didn't invest all that time for it to just sit there. Laurie! You are making me homesick. I love your new scenery! Your new house seems so lovely. The quilt wall!! The sewing room! 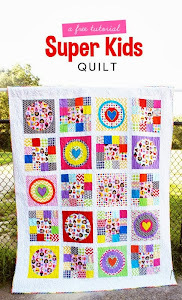 A new modern quilt guild. It's like you aren't even skipping a beat! But still, I wish we had overlapped longer. Good luck with the new paper pieced quilt. I will hope to derive courage through you to do one myself! I'm excited about how it's going to turn out. 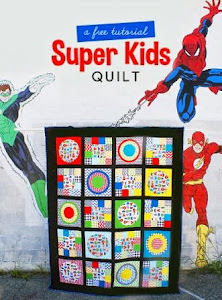 I LOVE quilts made out of solids. We have a quilt wall, too, but it's much smaller than yours. And my kimono quilt is there most of the time. Your quilt looks lovely on the wall and I'm sure that wall will provide more inspiration for you!